Bluegrass-style mandolin requires a strong well-coordinated right-hand technique. In this new thirty-minute DVD, bluegrass mandolin master Joe Carr reveals his method for developing super fast, strong and accurate picking. Specific play-along exercises concentrate on alternating, combination and consecutive down picking. Also featured are Monroe style and two styles of Crosspicking. 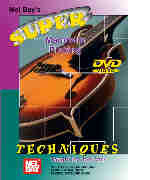 This DVD introduces the basic techniques of flatpicking and is a great workout, warm-up or exercise tool for developing right-hand power and control. (30 min.) Download now from PlayBetterBluegrass.com!